Icelandic yarn has many benefits: being warm, lightweight, water-resistant. The Icelandic yarn is made of Icelandic wool. Firstly, what is Icelandic wool? Here’s a brief introduction. Icelandic wool is the hair of Icelandic sheep. The history of the Icelandic sheep is as long as that of the Icelandic horse. That means they have a history of more than a thousand years. Icelandic sheep are the descendants of the sheep that the Vikings brought from Scandinavia and Ireland and was almost not crossbreed with any other breeds of sheep. So they are purebred sheep. Living in the extremely cold environment for more than a thousand years, generation after generation, Icelandic sheep have developed a unique ability to resist chill and disease. The obvious difference between the Icelandic sheep and other sheep is that the Icelandic sheep is covered with thick wool all year round. In particular, hair of the outer layer is called tog, which is long, tough and can resist water. The function of outer fibers is similar to an overcoat for humans. Hair of the inner layer is shorter, softer and insulating, which equip Icelandic sheep with the ability of resistance to extreme cold. Lightweight: Icelandic wool is lighter than many other types of wool. Being warm: two layers of wool fibers keep you warm and resist to the cold. Breathable: allows air to pass through. Odor resistant and biodegradable: usually bacteria does not stick to wool. Lopi, originally meaning unspun wool, is now the general name for the wool of Icelandic sheep. Although Iceland’s pastoral of long-haired sheep has several hundred years, the Lopi has only a history of several decades. The traditional yarn of Iceland is a wool blend. The woven fabric is thick and heavy. At the beginning of the 19th century, several ladies directly twisted Icelandic wool without blending, turning out to be good effects. It was light and warm. The same sweater made of pure Icelandic yarn was almost half lighter than the one made of blended yarn, and the heat insulation was also very good. Today’s Lopi yarn consists of two layers of wool, which come from the different hair of Icelandic sheep. The first layer is the outer hair of the sheep, which is long, rough, and has a certain degree of waterproof property. It means that the droplets will roll down when water drops on it. The other layer is the sheep’s inner hair, which is soft, light and well insulating. When making Icelandic yarns, the two types of hair are evenly mixed together. According to the different mixing ratio and the thickness of the yarn, the Lopi yarn spun out is divided into Alafoss Lopi, Lett Lopi and so on. Our factory produced this style of yarn. It has optional sorts. For example, wool can be blended with acrylic. Compared with traditional Icelandic yarn, acrylic Icelandic wool is less expensive, but it is still tough and lightweight. It can meet people’s daily needs. Also, it can be made into yarns with different wool content. Icelandic yarns are popular for knitting due to the special fiber structure of Icelandic wool. 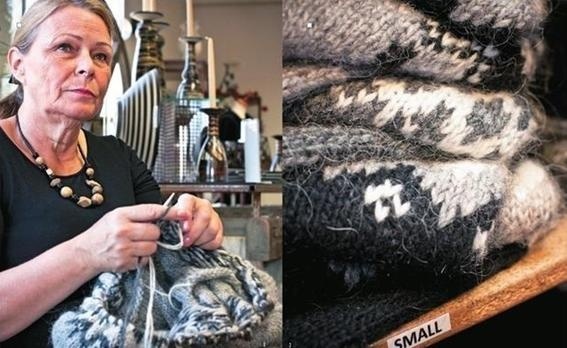 Whether you want to make a sweater, a scarf, a hat or any other garments, Icelandic yarn Lopi is a wonderful choice. This entry was posted in blog and tagged Icelandic wool yarn.